The ICC alleges that Warfali featured in videos in which 33 bound captives were murdered in cold blood. It has demanded the LNA officer be handed over for trial in The Hague where the court sits. In an open statement to the ICC today the LNA said that Hafter had ordered an investigation on 2 August and Warfali had been under arrest since then. There may be some significance to the LNA’s claim that Warfali was detained almost three weeks ago, well before the ICC issued its warrant. However, the LNA had in fact said last month, before Hafter issued his order, that Warfali was already under investigation. 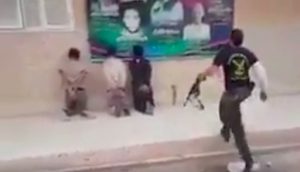 After the first execution video emerged this March, the LNA said it would prosecute soldiers who murdered or abused prisoners. In May after further execution videos surfaced in which Warfali again appeared to feature prominently, he made a very public resignation. Two weeks later however, Saiqa commander Wanis Boukhamada refused to allow him to quit and promoted him from captain to major. Last month, when the UN Human Rights Commission demanded Warfali be suspended while the crimes recorded on the videos were investigated, the LNA retorted that the UN body should not prejudge the “unverified” footage. Under its statutes, the ICC can only prosecute those suspected of war crimes or crimes against humanity if the local courts have failed, for whatever reason, to take action themselves. The LNA would seem prepared to argue that it is under the authority of the internationally-recognised parliament, the House of Representatives (HoR) and is therefore competent to try Warfali. However the international community also recognises the Presidency Council (PC) in Tripoli, which would currently appear to have no chance of taking the Saiqa officer in to custody.